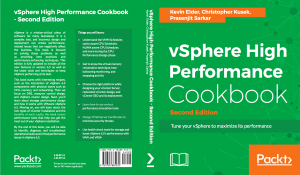 We are excited to announce the release of Kevin Elder and Christopher Kusek’s new book, vSphere High Performance Cookbook! Xiologix engineer, Kevin Elder, and Xiologix CTO, Christopher Kusek, have teamed up as author’s in their latest book: vSphere High Performance Cookbook! vSphere is a mission-critical piece of software for many business. It is a complex tool, and incorrect design and deployment can create performance-related issues that can negatively affect the business. This book is focused on solving these problems as well as providing best practices and performance-enhancing techniques. This edition is fully updated to include all the new features in version 6.5 as well as the latest tools and techniques to keep vSphere performing at its best. This book starts with interesting recipes, such as the interaction of vSphere 6.5 components with physical layers such as CPU, memory, and networking. Then we focus on DRS, resource control design, and vSphere cluster design. Next, you’ll learn about storage performance design and how it works with VMware vSphere 6.5. Moving on, you will learn about the two types of vCenter installation and the benefits of each. Lastly, the book covers performance tools that help you get the most out of your vSphere installation. Follow us on social media to learn more about opportunities to receive a free copy and upcoming book signing and meet the author events! Q: What brought you to write this book? A: (Christopher) I was contacted by Packt to author the second edition of this book based on the success of the original VMware vSphere Performance: Designing CPU, Memory, Storage, and Networking for Performance-Intensive Workloads. With technology advancing as fast as it is, it was time to bring updated information to the forefront. A: (Kevin) Christopher and I have worked on many projects together so when he asked me if I was interested in authoring a book I thought that co-authoring one with Christopher would be a great first step. I was the technical reviewer for another VMware book from Packt so it was a good fit. A: (Kevin) We started the conversation near the end of October 2016. So from first conversation to release, it took about eight months to complete. A: (Christopher) We were extremely busy with engineering projects much of the winter and spring so we took the time needed to ensure a quality, helpful and insightful product. Q: Did any challenges arise while working on the vSphere High Performance Cookbook? A: (Kevin) We were actually updating the book before vSphere 6.5 was officially released so we had to go back and update the first couple of chapters when it came out. Q: What are your goals with this book? A: (Christopher) We wanted to give people a performance guide that was fully updated for the new version of vSphere. A: (Kevin) We also included things that we have learned through the many years of using vSphere that are still relevant today. Q: Any thoughts on additional books moving forward? A: (Kevin) I don’t have any immediate plans but I really enjoyed this experience, especially authoring chapters 8 and 10 which were brand new for the second edition. A: (Christopher) I will keep you posted! Kevin Elder is a Principal Architect and Engineer at Xiologix LLC. With over 15 years of experience in IT, focused on selling, installing, and supporting virtualization and storage technologies, Kevin is responsible for customer success from initial design through implementation. He has been installing, managing, and selling VMware products for over 10 years. Kevin holds a VCP 6 and is a Dell EMC Elect for 2017. Christopher Kusek lives in Portland, Oregon where he is Chief Technology Officer and Executive VP of Engineering at Xiologix. With over 20 years of experience in IT as a technology evangelist and industry leader, Christopher plays a key role in Xiologix’s growth, leading its storage and engineering practice to evaluate and architect solutions that meet the client’s tactical and strategic goals. He has over 20 years of experience in the industry with virtualization experience running back to the pre-1.0 days of VMware. He has shared his expertise with many far and wide through conferences, presentations, CXIParty, and sponsoring or presenting at community events and outings, whether it is focused on artificial intelligence, cloud, machine learning, networking, security, storage, or virtualization. Christopher has been a frequent contributor to VMware communities, vBrownBag, Twitter, and YouTube, and has been an active blogger for over a decade. Christopher is a proud VMware vExpert and a huge supporter of the program since its inception. He continues to help drive the growth of the virtualization community. He was named EMC Elect in 2013, 2014, 2015, and 2016, and continues with the renamed program of Dell EMC Elect in 2017. Christopher is a Cisco Champion 2016 and 2017, and has been a member of the VMware vExpert Program for nearly 10 years. Christopher is a vExpert specialist in the breakout designations of vExpert VSAN and vExpert NSX, and he’s been a frequent contributor to VMware communities such as vBrownBag. Christopher shares his expertise online in the Thwack community as a SolarWinds ambassador, and he’s a regular contributor and delegate to the Gestalt IT Tech Field Day series. You’ll find Christopher directly through his Twitter handle, @cxi, and on his YouTube channel, CXI. Prasenjit Sarkar is a product manager at Oracle for their public cloud, with a focus on cloud strategy, Oracle Ravello, cloud-native applications, and the API platform. His primary focus is driving Oracle’s cloud computing business with commercial and public sector customers, helping to shape and deliver a strategy to build broad use of Oracle’s Infrastructure as a Service offerings, such as Compute, Storage, and Database as a Service. He is also responsible for developing public/private cloud integration strategies, customers’ cloud computing architecture visions, future state architectures, and implementable architecture roadmaps in the context of the public, private, and hybrid cloud computing solutions that Oracle can offer. He has also authored six industry-leading books on virtualization, SDN, and physical compute, among others. He has six successful patents and six more patents pending at the US PTO. He has also authored numerous research articles.